When teaching kids the parts of a book you can’t forget the front cover! 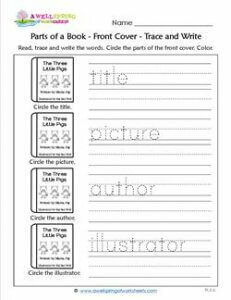 This worksheet reinforces what you’ve taught kids is on the front cover of a book – the title, a picture, the author’s name and the illustrator’s name. Kids trace these words and then write them on the lines. They also circle the part of the book in the example. This worksheet goes with this worksheet.